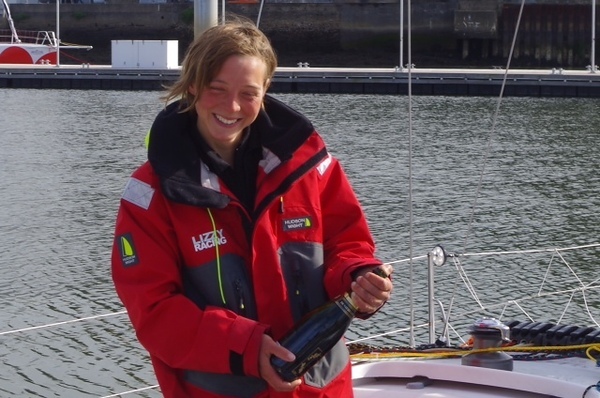 Early this morning Lizzy made it back to the Lorient dock in France. This is the story of her return, in her words! I left the dock in France for my final qualification journey at 14.30 on Tuesday 13th May, having finished preparing the boat with the help of my fantastic preparateur- aka my Mum Margaret! I had decided to do the Atlantic loop in a clockwise fashion, heading south first with the aim of basically being able to sail the majority of the course downwind with a forecast of an average 15 knots. Unfortunately the only problem leaving for a 1000 mile qualification passage in an established high pressure system was that light winds were inevitable and I was trapped for 3 days with little breeze, usually going backwards rather than forwards! Towards the end of the week thunderstorms and cyclonic winds featured, causing me to have to lose another day of mile-building by sitting out a storm in Camaret (Brest). I finally arrived back this morning, mooring at 07.45 after a total of 10 nights and 11 days at sea. Unfortunately the excitement of having gained my qualification miles could not be immediately enjoyed as I was in the biggest mood ever – having spent 6 hours trying to get from Ile de Groix up the channel into Lorient. Overnight the wind had become light and the tide had turned, which saw me drifting towards rocks, going backwards, being passed by numerous RIB drivers and fisherman, none or whom would spare a few minutes to give me a much needed tow in. At one point I was even walking / pushing / pulling and swearing at my boat along a pontoon as it was quicker than sitting in the adverse tide! I was in tears at one point, overcome with tiredness. Finally arriving to find my Mum asleep in the van (that I had expected to be in hours before), we cracked open the champagne from Hudson Wight and after having a few sips I definitely felt better. I had achieved my aim of the past three years. 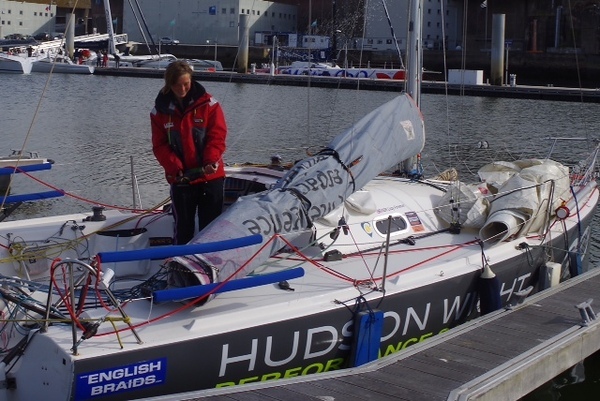 There I stood on a pontoon next my boat, in France, qualified for the Mini Transat! A huge ‘thank you’ to all my sponsors and for the support in getting me this far. As Classe Mini states, the qualification passage has certainly caused a ‘change’ in me; lost a few more marbles I expect, but I know life at sea is the one for me.